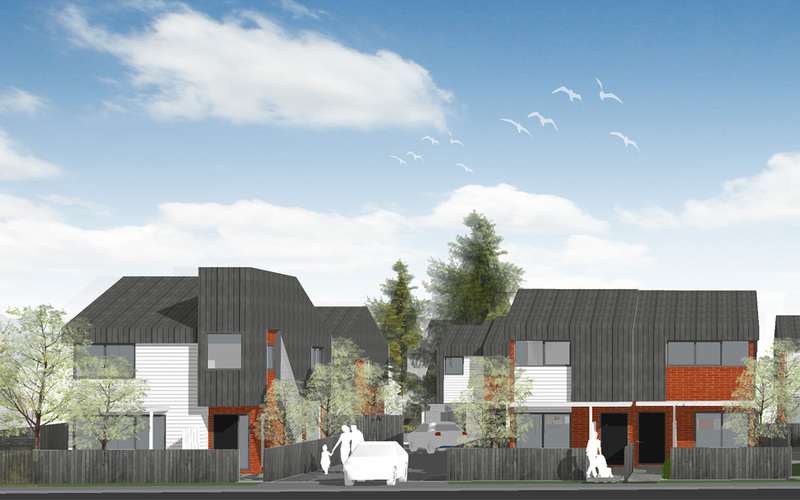 The Intentions for the design of Walters Road development for Housing New Zealand Corporation is about setting “best practice” principles in achieving good quality houses and streets for the occupants. 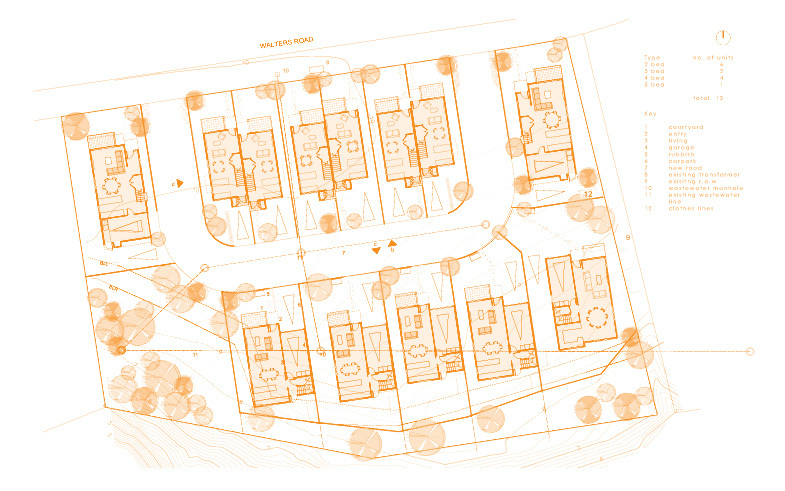 It recognises the issues of land use efficiency, community and suburban sprawl. Through good planning and architecture these issues are addresses by ways of increasing density and achieving quality living spaces. 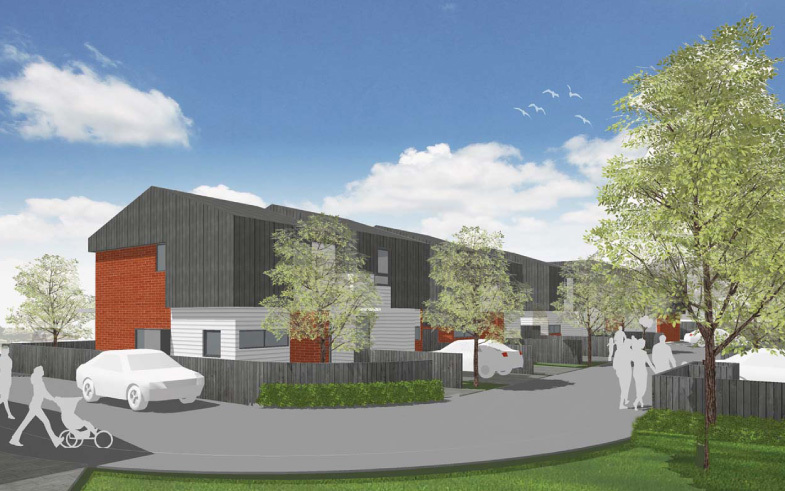 The site is located between Mt Wellington and Otahuhu and it is in close proximity to public transport (Mt Wellington Highway), commercial districts (Sylvia Park & Otahuhu town centre), schools and public amenities. 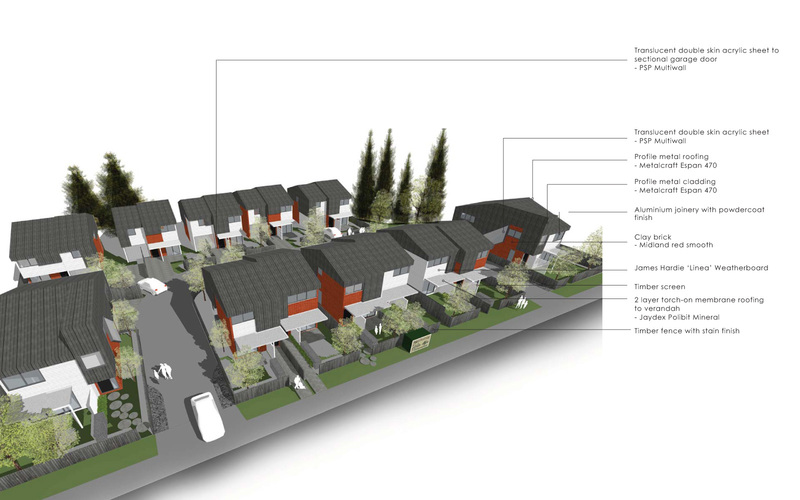 The development consists of 13 residential units of varying sizes to accommodate different sized families. The masterplan takes advantage of its north orientation, and this arrangement allows for a series of buildings to face the street, giving it a strong street presence. A “shared space” loop through the site provides efficient vehicle and pedestrian access to the bigger units at the rear and the ground is differentiated through textures instead of kerbs. 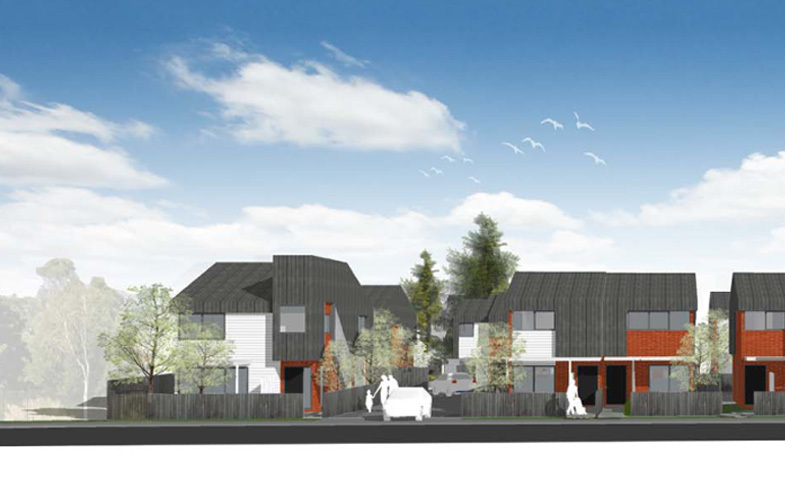 The masterplan takes into account CPTED principles, the buildings passively survey the streets and driveways. There are no “dead ends” or “dark corners” and there will be adequate street lighting to create a safer environment for the residents. The buildings pick up and reinterpret various building types and materials found in the immediate area. They take the form of a series of gables, different to the traditional relationship of gable ends. They are rotated so that the lower ends face the street and are less dominating to the frontage. They are further articulated by extending the roof cladding down into the first floor, giving a bigger presence of the roof element. This composition is sympathetic to the street and its surrounding context. The materials are selected for their aesthetics, low maintenance, durability and sustainability. 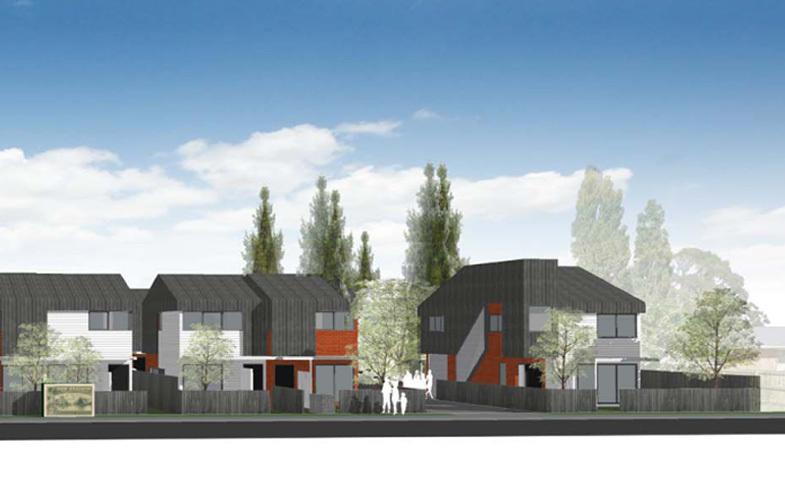 The roofing is profiled metal and upper story cladding is a mixture of metal and weather boards, both are traditional materials in NZ residential architecture. The ground floor cladding is red bricks, as found in some of the surrounding properties, a material that is robust and signifies stability and permanence.